Create this unique gemlike soap with simply clear melt and pour base, colorants and fragrance. Note: When making a gem duplication, it is helpful if you have a real one to compare with for the coloring and design. I bought an amethyst at a trinket shop for a dollar for this purpose. 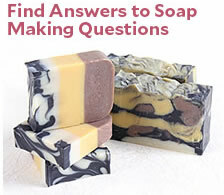 For instructions on melting your soap, refer to the Basic Melt and Pour Soapmaking Instruction page. 1. Chop some clear base into 1/4-1/2 inch, irregular pieces. You’ll need about a 1/2-3/4 inch layer of chunks to cover the bottom of your container as well as the same for the top of the soap. Toss chunks with enough Super Pearly White Mica to lightly cover all pieces. Reserve half of pieces for the top. 2. Place pieces in the bottom of your chosen container. Press down firmly on the pieces. If your base is nice and fresh, the pieces should lightly adhere together with this firm pressure. 3. Melt some clear base (start with 4 oz and add more as neccesary). Fragrance if desired. When cooled to approx. 130 degrees, pour over the soap chunks to cover. Don’t spray the soap chunks before pouring the soap over. The reason is that later, you want to be able to remove some of the chunks from the bottom; spraying before hand will cause the chunks to adhere too tightly to the overpour. 4. While the covered soap chunks are cooling a bit, add a drop of liquid purple soap dye to the remaining melted soap. If necessary, add more clear base and re-melt; if you are fragrancing the gem, add a few drops of fragrance each time you add more soap. You want this layer to be a very pale purple. 5. Spritz the soap in the container with alcohol. When the pale purple soap is about 130 degrees, pour a 1/2 to 1 inch layer over it. It’s not necessary to spray away the bubbles as a few give realistic looking flaws to the gem. Put a folded up piece of paper underneath one edge of the container, causing the layer to be little uneven and let cool a bit. The great thing about this project is that the more imperfect it looks, the better! 6. While the gem soap is cooling, add more soap to the melted purple if needed to pour another layer. Remelt and add a few more drops of fragrance if needed; add another drop of liquid purple color and stir. You want this layer to be a little darker looking than the previous purple layer. If you have an amethyst, use it to match the shade of purple for this layer of soap. Getting the soap too dark will look unnatural so add color sparingly. 7. If the soap in the container has cooled enough to form a skin over it, spritz with alcohol and pour in a 1/2 to 1 inch layer of 130-140 degree, darker purple soap. You can leave the container flat, or angle it again in a different direction. You can be creative in making your own natural looking imperfections. When layers are cool but still soft, I squeeze the sides of the container fairly hard, creating gaps between the gem and inside of the container as well as upheavals on the top surface. Allow any melted soap inside the gem to seep into the gaps. This will help mingle the colors and create even more realistic irregularities when you are done. The only mistake you can make when doing this project is to have anything end up looking too straight or perfect! 8. Add enough melted clear base to the melted purple to lighten the color. Add a few drops of fragrance if needed. When the gem soap has cooled to form a skin, spritz with alcohol and pour another layer with the lighter purple. Repeat this step again using only a 1/2 inch clear melted soap for the last layer. 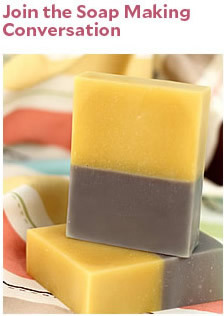 After a skin has formed on the last poured layer, drop in all of the reserved soap chunks pressing them into the last layer with a spoon if neccessary. Try to have chunks sticking out of this last layer to give a rough, crystalline look to the top. Continue to squeeze the container randomly while soap is still soft. 9. When soap is completely cool, pop it out of your container. You may have to turn the container over and press hard on the bottom to get enough air underneath the soap so it will slide out. 10. Cut the block of soap in quarters so that you have 4 deep, wedge shaped pieces. If you want to make the soaps smaller, cut the block into six pie shaped wedges. Take one of these pieces and with a dull knife, small spoon or your fingers, break away some of the looser chunks from the top and bottom to give a rougher, more crystalline look to it. With a sharp knife, trim the soap gem so that one end is more tapered than the other. Cut edges of soap at interesting angles to give the gem a faceted appearance. If the soap “crystals” on the top or bottom seem appear to be to loose, dip them into melted clear soap base (130 degrees) to stabilize them.